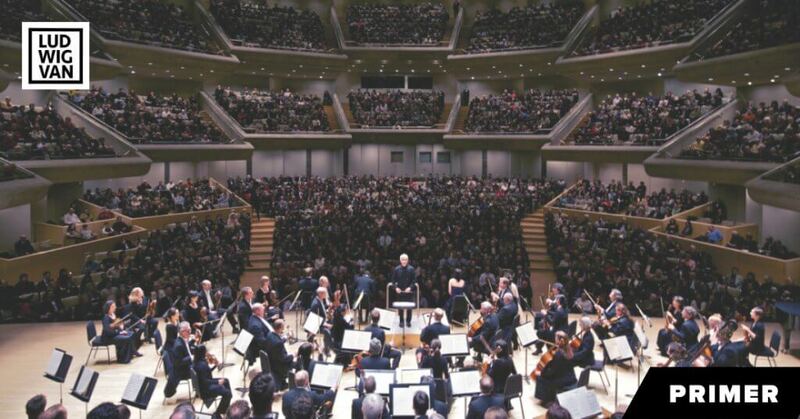 FEATURE | The Story Behind The Sale Of "The Holy Grail Of Glenn Gould Manuscripts"
The USD 100,000 paid yesterday for one of the scores Glenn Gould used for his 1981 recording of Bach’s The Goldberg Variations establishes a benchmark price for further auction sales of the Toronto pianist’s intellectual work and ephemera. The sale to an anonymous buyer comes with a $25,000 buyer’s premium. “A Holy Grail of Glenn Gould manuscripts” was Bonhams’ pitch promoting the New York auction house’s sale of the heavily annotated copy Gould used to check audio and film editing of the filmed recording. Gould’s punky, 1955 gunslinger-like recording of the work launched his international career. Markings on a commonplace C.F. 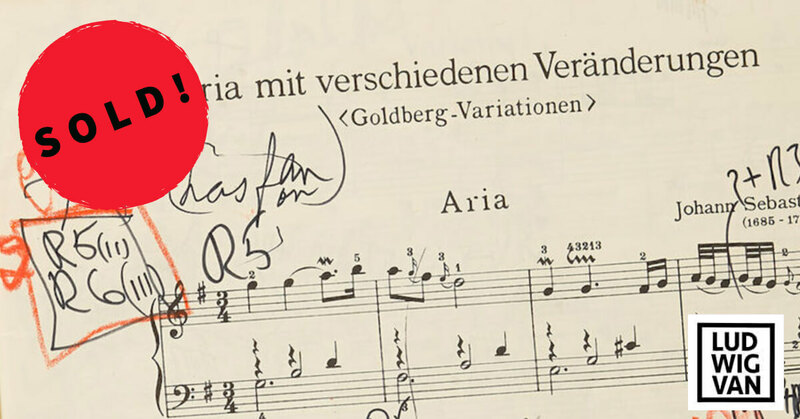 Peters edition — Gould didn’t much discriminate between editions he used, own markings being the paramount distinction — were most likely memorandum of edits already made. The manuscript is in essence visual evidence of Gould listening to Gould already edited by Gould. The question is: who is going to be able to untangle the meaning left by the jumble of lines? “With this kind of manuscript, you’re looking for “cultural-historical importance and development of a musician,” Darren Sutherland, Bonhams manuscript specialist told me before the auction. Negotiations for the Bonhams sale started eight months ago. 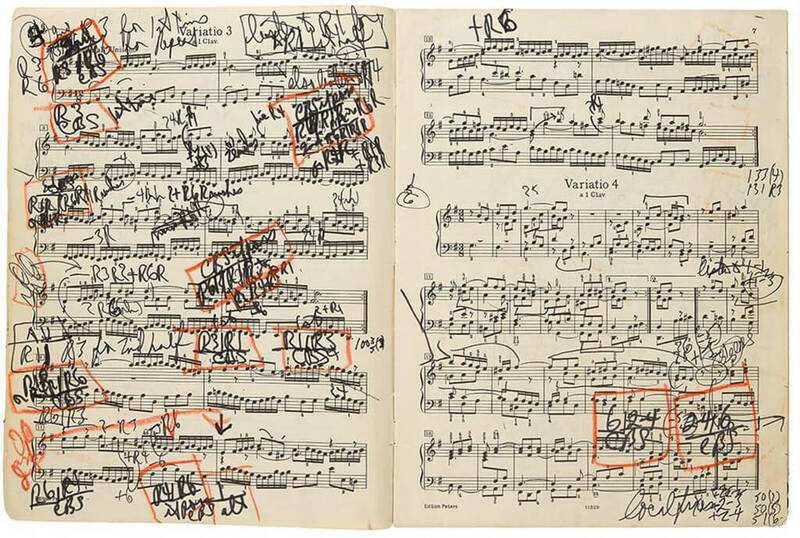 Expectations along the way grew bullish enough to suggest that the manuscript — with Gould’s scattered notations in black flair pen and with orange markings — might earn up to $200,000 (Canadian) at auction. 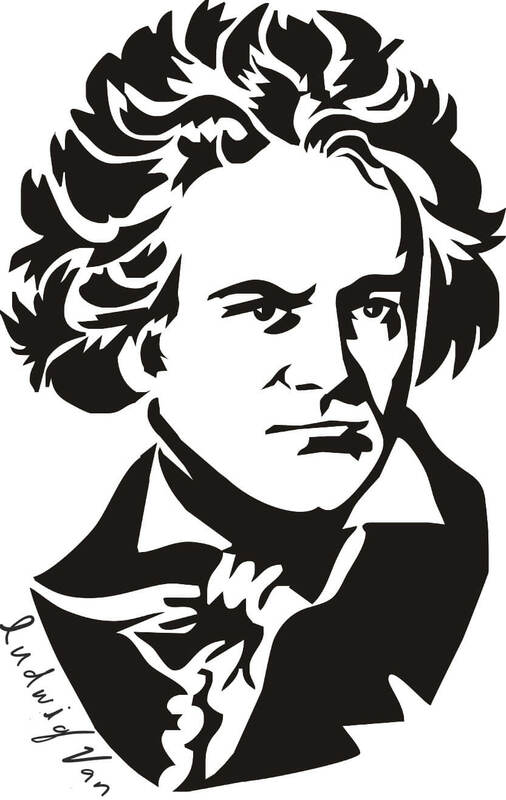 (Last June Bonhams set its own record price selling two pages of Beethoven’s “Emperor” Piano Concerto No. 5 Op.73 in the composer’s hand for $250,000 (US). In any event, the sale and its pre-sale publicity keep the Gould brand alive, affirming the market potential for other projects already in progress. They include a projected romantic film biography about the pianist and his “secret” affair with American artist Cornelia Foss and for a touring Gould holographic stage show. The Gould Estate’s new deal with Primary Wave Music for everything Gould is expected to bring a modern pop hustle to the iconic brand name. 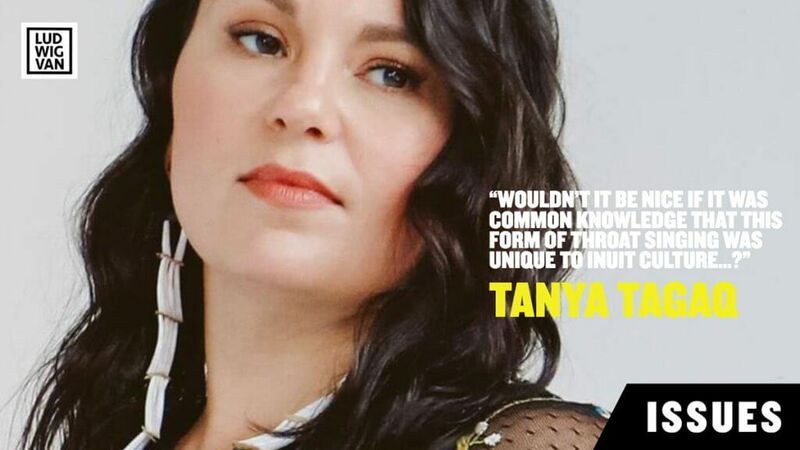 Indeed, the many unknowns that come with the score serve to increase Gould’s emerging “growing outsider status, something like a James Dean or even a Jim Morrison,” says Tim Page, a Gould friend and journalist who edited The Glenn Gould Reader. Page compared Gould’s two Goldberg Variations earlier this week in a lecture at Bonhams. Major music manuscripts don’t fetch eye-popping sums earned by Post-Impressionist paintings, the thoroughbreds of the art auction market. For example, auction house records were set in 1987 on both the art and music front. But the $4.34 million (US) Sotheby’s hammered down for a 508-page manuscript of nine Mozart symphonies written in the composer’s hand — a record figure at the time for any manuscript sold at auction — still dwarfs in comparison to the record-breaking $39.85 million (US) Christie’s in London brought in for Vincent Van Gogh’s Sunflowers. On the other hand, almost all of Gould’s notations have scholarly value and intellectual cache. “You are trying to make an educated assessment of value depending on past records and what it means to a wider cultural context,” says Bonhams Sutherland, who once ran The Strand’s Rare Book Department. The Bonhams’ sale generated a whirl of questions throughout Gouldworld. It wasn’t who was buying that mattered, as much who was selling? Is it being put on sale by Ray Roberts, known to have a cache of Gould material in his basement which needs a home. Peter Goddard is the author of The Great Gould. Peter Goddard has held positions as the pop music critic for The Globe and Mail, the Toronto Telegram and the Toronto Star. He received the 1973 Juno Award as Music Journalist of The Year. He is the author of 17 biographies including Frank Sinatra, Michael Jackson & The Jacksons, David Bowie, The Rolling Stones, and Glenn Gould.